I’m going to let you in on a little FSBO secret. In fact, I’m going to tell you the #1 thing you can do (that you haven’t been told already) to convert FSBOs into clients. You’re going to want to write this down somewhere. Now before you start yelling “I’m already trying to do that,” let me assure you that you are not giving them what they actually want, otherwise they’d be flocking to you, right? You are giving them what you want – to try and get them to list with you. So what does a FSBO want? If you answered, “to sell their home,” you answered wrong. Those are all part of the end goal too, but those are not completely right because it's not what the FSBO really wants, because a FSBO thinks they can do all of that without you. Here is what a FSBO really wants to do: Sell their home by themselves. They feel they can do it alone and get the top dollar. Agents know that a homeowner can’t do all this effectively and efficiently, otherwise 2 million agents wouldn’t be employed, but some homeowners need to learn by experience. You can call and call and call in attempt to convince them of your value, but most of them will not believe you, at least not at first. You can send email after email with articles explaining how listing as FSBO is a mistake, but most of them will not believe you, at least not at first. You can give client testimonials from FSBOs that couldn’t make it alone and but eventually listed with you and sold their home for top dollar, but most of them will not believe you, at least not at first. The truth is, most FSBOs will eventually list with an agent, but not at first. Not until after they have tried it alone and realized how much time and energy it takes to sell without an agent. Who they eventually list with, however, is up for grabs. They will most likely list with an agent they trust and they have built a relationship with. You can build that relationship and trust by giving them what they want: show them how to sell their home alone. You are a real estate professional. Nobody is better suited to show them how to sell their home alone than you. For a short moment, put yourself in the shoes of a homeowner trying to sell their home as a FSBO. You have a new job in a city too far to commute. As stressful as it is to move your family, it's something that has to be done. Since listing it on Craiglist, you get 10-15 calls each day from real estate agents, all promising ” I have the best marketing plan” and “I can sell your home for top dollar,” or even occasionally hearing “I may have a buyer, but I need to see your home first,” only for the agent to come and try to list your home. Upset with all the calls from agents telling you it's too hard and you can’t do it, you finally close off the idea of using an agent and are determined to do it alone. We all know that moving a family and selling a home can be stressful. And because of that, most FSBOs eventually list with an agent. But when a homeowner gets call after call from agents telling them it's too hard and they need to list their home with an agent, their frustration only compounds. Every homeowner is going to welcome that sort of helpful text message or phone call, especially after the bombardment of calls from agents trying to list their home. Follow up that initial call or text with a few more calls or text messages to give more tips and advice, or maybe just to say hi. Eventually, stop in and introduce yourself, check on their progress and build a personal, meaningful relationship. Show that you care about them by investing in a relationship and not asking to list their home. Investing in a relationship will go further than any other form of advertising. When it comes time for that homeowner to give up and finally pick an agent, what agent do you think they will contact? A random agent? No way. The agent that has been pestering for a month them about listing their home? Doubt it. A friend that happens to be an agent? Maybe, but if they do, no other agent stood a chance anyway. You, the only agent that was helping them sell their home alone? I’d take that bet to Vegas any day. Worst case scenario, they actually sell their home, which statistics show most will not. But even if they sell it, what are the chances that homeowner gives you a quality referral down the road when a family member or friend asks if they know a real estate agent? Pretty darn high. Negotiating, CMAs, or contract work, however, is technical work that you only perform for clients, but homeowners will understand that. 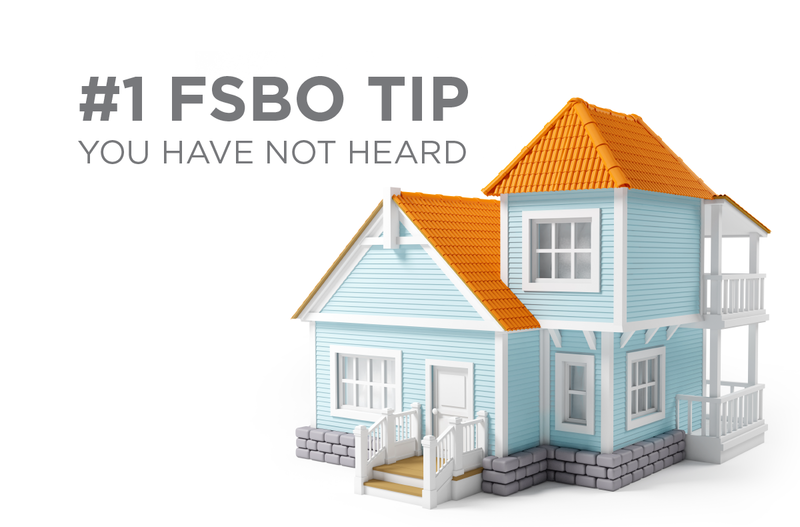 Giving marketing advice and guidance, such as how to stage their home or tips on a good open house, is the most valuable thing you can give to a FSBO. After all, you are the pro. If you want to separate yourself from all the agents trying to pick the low hanging fruit and just get an easy listing (because that is exactly how FSBOs really feel about agents calling them), you need to build a deep, meaningful relationship with the homeowner in order to have their trust. You do that by helping them and giving them advice that you have learned by years of experience. So what is the #1 way to attract FSBOs? Give them what they want.